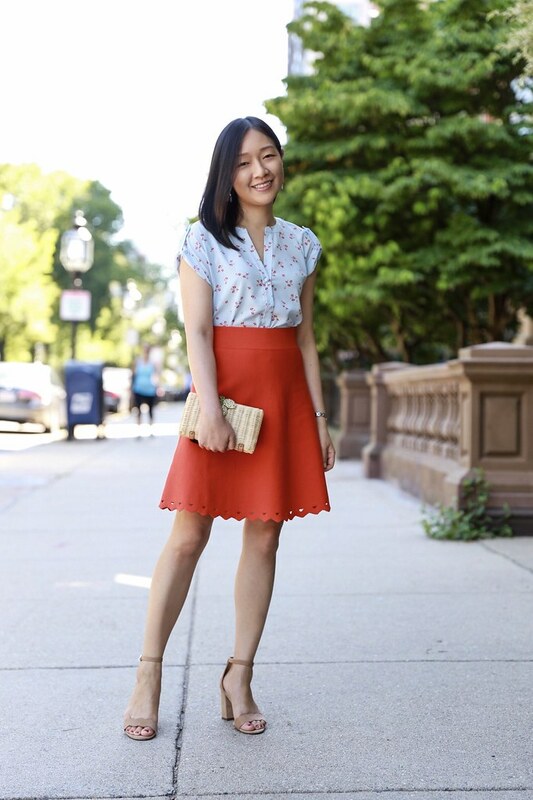 I’m partnering with Ann Taylor to share this summer look that’s perfect for a Sunday stroll in the city. I love this lily print blouse (size XXS petite fits like size XS) paired with this bold scalloped knit skirt (true to size) or with white jeans as seen on me here. Block heel sandals are perfect for the city so that the heels don’t get stuck between the pavement cracks. I’m eyeing this pair of cork block heel sandals since it’s the perfect neutral. I love the simplicity of these linear earrings which are also available in pink which my store didn’t have. They add just the right touch while staying true to my love for for minimalist jewelry and delicate pieces. 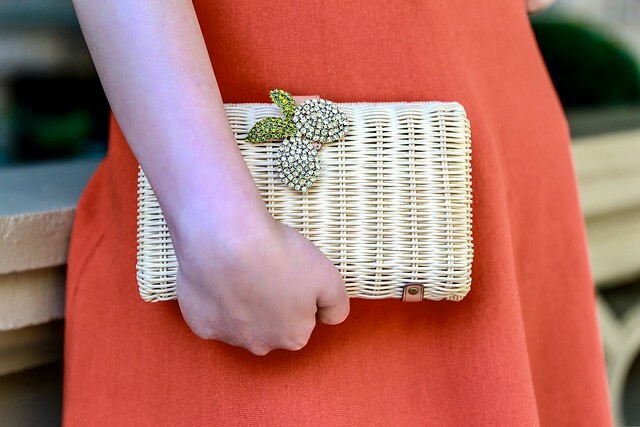 This lemon pin (c/o) is so pretty on the strap of my rattan clutch and it looks like it belongs there. If you love lemons they’re also adorned on these Izzie lemon stone espadrilles I reviewed here. To ensure that you don’t lose the pin I would highly recommend tightening the clasp with pliers as mentioned here. 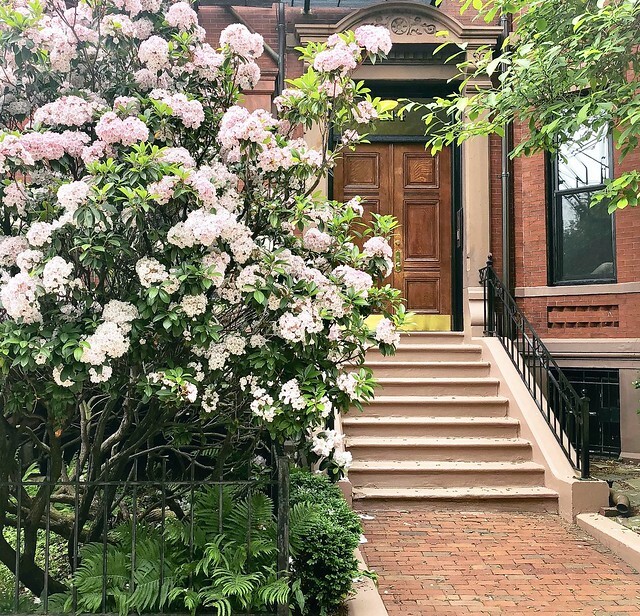 I took this stoop photo on my iPhone but it seemed fitting to share in this post since Boston is so beautiful in the summer. 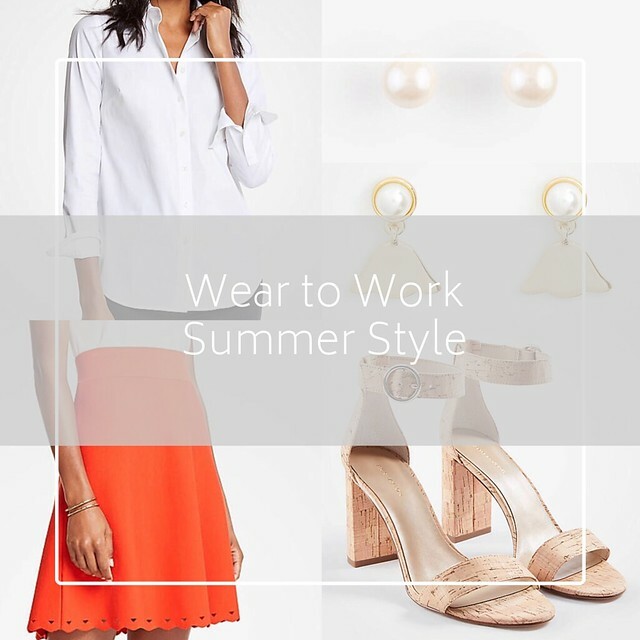 Get 40% off your purchase + an extra 10% off at Ann Taylor. Use code MAKEPLANS. The sale on full-price prom0tional styles ends tonight 7/23 at 3AM ET. I noticed that select full-price sandals are on promotion for $59.50! 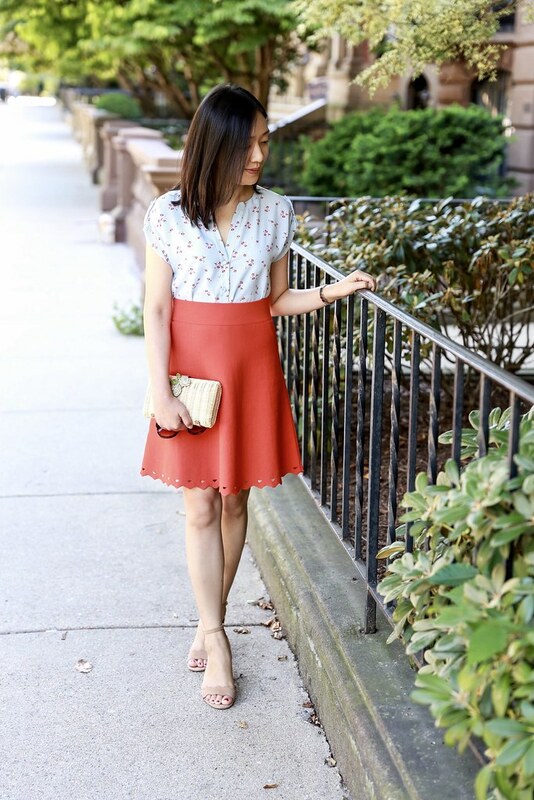 This geo scalloped pintucked shell (review here) is one of my favorite new purchases since I love a good white top. Update 7/29: Now get an extra 60% off sale styles during the Semi Annual Sale. Shop new styles added to the sale today! I linked to my previous reviews (where available) if you need help with sizing. For size reference, I’m 5′ 2.5″ and 108 pounds with a petite frame. Floral Pleated V-Neck Shell – Review here. Available in solid colors here. Lace Trim Scoop Neck Sweater – Review here. Refined Cotton Ruffle Shell – Review of the navy color here and review of the white color here and here. Tie Wrap Top – Review here. Dotted Ann Cardigan – I bought this cardigan for my mom. She fit her usual size large regular. Paneled Split Neck Shell – Review here. If you prefer sleeves over sleeveless tops then this navy fluted sleeve tee is a great basic. Pointelle Peplum Sweater Shell – Review here. Floral Corded Ruffle Neck Shell – Review here and here. Chambray Trench Coat – Featured here and reviewed here. Seersucker Newbury Blazer – Review here and here. Eyelet Newbury Blazer – I have the seersucker Newbury blazer in size 00P which fits like size 0P. Geo Check One Button Blazer – Size 00P fits like size 0P. Ruffle Denim Jacket – Review here. Bow Strap Sheath Dress – Review here. Capri Garden V-Neck Maxi Dress – Featured here and reviewed here. Cotton Sateen Tie Front Sheath Dress – Featured here and reviewed here. Floral Sleeveless Shift Dress – Featured here and reviewed here. Tropical Leaf Bauble Midi Dress – Review here. Embroidered Ruffle Sleeve Shift Dress – Review here. Floral Halter Bow Back Flare Dress – Review here. Seamed V-Neck Sheath Dress – Review here. Tie Shoulder Midi Dress – Review here. Mixed Lace Flare Dress – Review here and here. Lace Belted Dress – Review here. Laser Cut Floral Sheath Dress – Review here and here. Polka Dot Ruffle Shift Dress – Featured here and reviewed here. Boho Floral Midi Dress – Review here. Chambray Wrap A-line Skirt – Review here. Modern Ankle Tie Skinny Crop Jeans – Review here. Modern All Day Skinny Jeans in Mariner Wash – Review here and here. The Chelsea Skinny Pants – Review here. Joggers – Review here. This drawstring jogger skirt also looks so comfy. Emeline Suede Block Heel Pumps – Review here. Izzie Lemon Stone Espadrilles – Review here. Krissy Metallic Leather Ruffle Slide Sandals – Review here. Pave Flower Double Strand Pendant Necklace – Featured here. Now $16.